Dimensions 0.50 by 5.25 by 7.50 in. Deafblind women; United States; Biography. Amazon.com description: Product Description: Paperback with 75 Pages of Additional Content (Summaries, Critical Notes, Glossary, Exercises, and more)Â Â The Story of My Life of the Ratna Sagar Classics Series is an enriched edition that any keen reader of literature will be pleased to have. The book includes: Â a. Brief, well-written Introduction to the autobiography b. Annotations that are comprehensive, covering not only the meanings of words and phrases peculiar to the period in which the book was written, but explaining any concept or historical event that may not be easily understood or recalled c. Summary at the end of each chapter that is concise yet sufficiently detailed to provide a faithful reproduction of that part of the story d. Critical notes at the end of each chapter that present an analysis of the chapter so that the reader can identify the nuances, allusions, and underlying meanings, and therefore appreciate the story better e. General notes at the end of the book that discuss the character of Helen Keller and the role played by several important people in her life f. Photographs of the author and some memorable people and moments in her life Suggestions for further reading and website links that the reader will find informative and helpful Â The Story of My Life was the first book by Helen Keller. Published when she was twenty-three, as a series in Ladies' Home Journal (1903), the articles were reproduced as a book only a year later. A reflection of Helen's life from an early age till her graduation from Radcliffe College, the early part of the narrative is based on incidents told to the author by her parents and teacher Anne Sullivan. It was Miss Sullivan who had encouraged Helen to pen the story of her life, relating the journey of a girl who overcame her visual and hearing disabilities, became proficient in several languages, went on to read the literature of various languages, as well as gained knowledge of mathematics and science. The arrival of Miss Sullivan in Helen's life is an important point in the narrative, indicating the young teacher's tremendous impact on the author's life. The latter part of the narrative depicts a more confident and sensitive Helen. It shows her increasing control over her life, her response to books, places and people, and a mind that was sensitive to the beauties of nature and literature. Â Written at the beginning of the 20th century, Helen dedicated her book to Alexander Graham Bell, who had been working on technology to help people with disabilities. 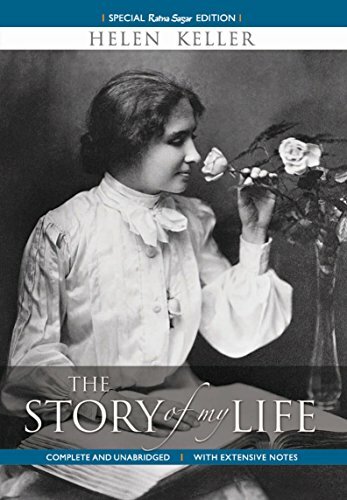 The story of Helen Keller's life is a celebration of the victory of human spirit and courage in the face of adversities. An amazing and awe-inspiring autobiography, The Story of My Life fills the readers with a deep sense of respect for the person who lived a remarkable life, and touched the hearts of millions by writing about it.